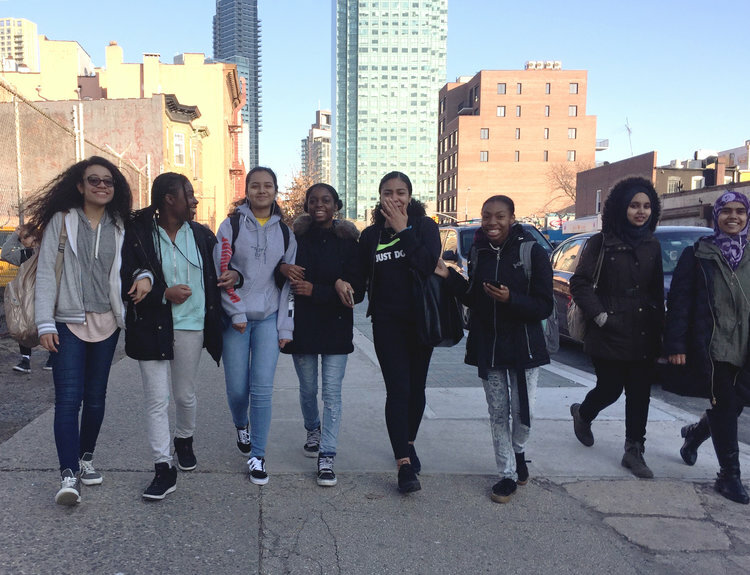 Young Women Who Crush (YWWC) is a climbing and leadership development program that provides opportunities for high school girls in NYC to experience the physical, mental, and emotional benefits of rock climbing. The program is a collaboration between The Cliffs and the Discover Outdoors Foundation. YWWC’s curriculum is developed by The Cliffs’ head coach and focuses on building a solid basis of climbing technique and rope skills. Perhaps even more importantly, the girls learn to define and work towards personalized goals, to use mindfulness and breath work in climbing, and to manage and work through fear. The program is designed to help young women recognize their own strength and realize their potential through a discipline they may not have experienced before: climbing. We believe that the lessons learned at YWWC extend far beyond climbing walls and have the potential to have long lasting, positive impacts on students’ lives. The YWWC program empowers girls to become not just climbers, but leaders in both their communities and the outdoors. Throughout the year, the girls are taught to value outdoor recreation, and through Leave No Trace and Wilderness First Aid trainings are given the concrete skills they need to become informed and empowered outdoor leaders. YWWC’s curriculum is designed around the school year and structured lessons are given monthly. The program’s coordinators are assisted by volunteer mentors who are members of the climbing community, which allows students to learn from women with a broad range of backgrounds, strengths, and teaching styles. The girls are also given memberships to The Cliffs so that they can continue climbing and working towards their climbing goals on their own time. Jamaya focused on her climb. The Cliffs at LIC. The program culminates in two outdoor trips, allowing urban students to experience nature and to translate a year’s worth of hard work on indoor walls to real rock. The girls are guided by AMGA-certified guides and have the extraordinary opportunity to develop their abilities at a world-renowned rock climbing destination: the Shawangunk Ridge, aka “The Gunks.” As part of their comprehensive outdoor education, the girls are expected to set up camp and spend the night at a primitive campground, where their outdoor skills are put into practice. Over the course of a school year, the girls transform into strong and confident rock climbers capable of scaling cliffs the size of city buildings. They learn to support each other and communicate effectively, and are given the opportunity to experience the outdoors in a truly unique and meaningful way. I want to give a huge thank you Alexis, Emily and Eva for making it possible for us to go to the Gunks on Friday. It was the best experience I have ever had in my life and I am truly thankful to have had such opportunity. I also want to thank all the people and the organizations that funded this trip. It truly meant a lot to have been given such an amazing opportunity for us to have an amazing experience that I will never forget in my life. There are literally no words to express how much I appreciate everything that has been done for me and my peers. I just truly want to thank everyone from the bottom of my heart for the support, love and care. Thank you, for exposing us to rock climbing which I might have never ever had the chance to explore. I truly love rock climbing and I hope to continue climbing! (though my body is sore from climbing all the four routes on Friday, there is strength and courage in it. It's a sign that I was able to push myself to the best of me. I could have never imagined rappelling from so high above but I have done it. This courage to do that was developed from all the support you have given and the number of practice climbing we did at The Cliffs). Again, this was an amazing experience for me. I will always cherish this trip! Our offerings include world-class climbing instruction, extensive youth programming, including free programs for underserved youth, community events, Lady+ Crushers, which offers instruction and a supportive community for women and gender non-conforming climbers, and Tristate Bouldering Series, competitions that draw amateur and elite climbers alike. At the Discover Outdoors Foundation, our mission is to develop empowered, curious and positive young leaders in urban communities through life-changing outdoor experiences. The Discover Outdoors Foundation serves students in grades K-12 in economically disadvantaged NYC neighborhoods as we believe that the outdoors- and the discovery, excitement, and growth it affords- should exist for all children to enjoy, regardless of their socioeconomic status. We use kayaking, canoeing, backpacking, hiking, and rock climbing to inspire students to become curious scientists within their classrooms, stewards of our environment, and leaders within their communities. Have a question about the program or want to find out how you can get involved? Get in touch with the YWWC team here.